Training with Casey for the past 2 years has helped me to become a much happier & healthier person. It has also given me the confidence in myself and in the way i go about my day to day life. I have a disability called Spina Bifida. This means that i am bound to a wheelchair and am unable to use my legs. Casey has managed to adapt our training regime to concentrate on my upper body strength. Before I started training , I was very cautious about going up and down hills, ramps or street crossings. I have now become more confident and as such am able to get around more independently. We have been training with Casey for several years. 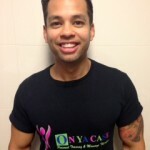 During this time, we have found Casey to be not only our personal trainer but someone who takes a genuine interest in our health and well-being. Casey is passionate about his work and is highly dedicated to his clients, he encourages and consults with you to ensure you work hard enough to achieve your goals. In actual fact, we are so happy with Casey and his approach to training that approximately six months ago we referred one of our friends to him for their own personal training needs. We met Casey approximately 5½ years ago. My son Jack is Autistic and was starting to be very disruptive during the swimming lessons which he took with my other son and said he wanted to lift weights and do gym. So my next step was to ask the Management if they felt they had a personal trainer that would be able to work with my son, given he can be so difficult and not always very accommodating. It was then that I was introduced to Casey, a wonderful, happy and bright young man that immediately seemed to have a rapport with my son. Anyone that knows Autistic children would know that for them to gain a feeling of trust usually takes a long time – but my son was extremely comfortable with Casey from the beginning. Since then, they have enjoyed each others’ company as Casey teaches Jack about fitness and the correct way to complete exercises and to use the Gym equipment. It is a really great working relationship as Casey often says he not only teaches Jack but Jack also teaches him. Jack has an amazing knowledge of a very wide selection of subjects and continually amazes Casey with the information he imparts to him. For us, it is amazing to watch the wonderful friendship that Casey and Jack share and we never cease to marvel that Casey has managed to continually capture Jack’s attention and to keep him motivated for such a long time. This is the first time that Jack has continued exercising for such a long time. We had begun to give up that there would ever be a form of exercise that Jack could participate in to keep him fit and healthy. Autistic children often don’t like a lot of noise or crowds and Jack is no exception and even though a Gym has both these elements, because he works one:one with Casey and his attention is focused on him he seems to not mind the other things going on around him. I have had Jack at home angry and loud and fighting with me about going to the Gym but after he has spent an hour with Casey he comes back out calm and content and able to hold a conversation with you. The exercise is a key component to assisting Jack to be calm and happy. We have no doubt that Casey does a wonderful job with Jack and the length of time he has been working with him is testament to this fact. We have not hesitation is recommending Casey as a personal trainer and a personal friend. Casey has a Diploma in Remedial Massage Therapy and I now have regular relaxation and remedial massage sessions with him. I have found his technique to be as good as I have encountered and an excellent way to end the working week. I can therefore recommend Casey’s services to any prospective client. As a primary school teacher and keen basketball player, Casey’s massages help me stay on top of my game in the classroom and on the court. I see Casey once a week as both a preventative and maintenance strategy. Casey provides a massage service that is responsive to my changing needs. He is especially invaluable during report card time when my neck and shoulders ache from hours spent at the computer. His deep tissue sports specific massages also enable me to play basketball three nights a week pain free. I highly recommend Casey’s massage services. It has become an integral part of my health and well being regime.